Passiflora edulis is a vigorous, climbing vine that produces a round 3-7 cm (1-3 in) fruit that ranges in color from purple to yellow and is known as passion fruit. This plant is another Brazilian native and commonly found in many Brazilian markets. The vine can grow 5-6 m (15-20 ft) per year, is short-lived (5-7 years), and bears fruit within 3 years, which become ripe 70-80 days after pollination. A ripe passion fruit has a wrinkled appearance, this does not mean that the fruit is old or has gone bad. 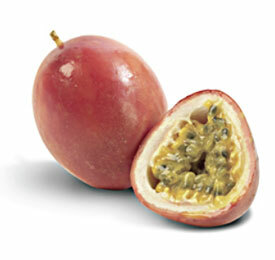 Passion fruit has a juicy interior filled with many seeds, it can be eaten raw or juiced. In Brazil, passion fruit mousse is a common dessert, and the seeds of the passion fruit are used to decorate cakes. Other cultures use passion fruit to flavor ice cream an make jellies and syrups. Brazil has a well-established passion fruit industry, which produces large quantities of nutrient rich juice. The purple passion fruit is preferred for consuming fresh since the pulp is less acidic and has a richer flavor similar to guava. The yellow variety is generally larger and used for juicing and making jellies and jams. Passion fruit is an excellent source of vitamin A and C and when eaten with the seeds is a great source of fiber. This nutrient dense fruit also contains vitamins B2, niacin, folate, B6, E, and K as well as potassium, phosphorus, magnesium, calcium, sodium, iron, selenium, copper, and zinc. The passion fruit plant has been providing people of the rainforest with food and medicine for many years. Natives used to use the leaves of the plant to make a calming tonic and the fruit was used to make a "heart tonic", furthermore, a passion flower drink called maracuja grande is still commonly used to treat asthma, whooping cough, bronchitis, and other tough coughs. The juice of the passion fruit is used to treat urinary infections and as a diuretic. Traditional Brazilian medicine still employs the powers of the passion fruit plant and rely on the plant for its healing qualities.